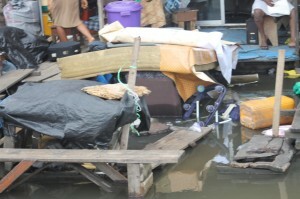 In response to Spaces for Change’s | S4C’s October 28, 2015 petition, the Federal Ministry of Housing and Urban Development (FMLHUD) has waded into the Badia demolitions which left hundreds of families homeless at the peak of torrential rainfall on 18 September 2015. A private family – the Ojora Chieftaincy Family – ordered and executed the evictions, with equipment support provided and operated by officials of the Lagos State Government. The displaced families were at all material times, owners and tenants of properties of various types, comprising brick, concrete, block and makeshift structures in Badia community, having acquired titles to the land from a variety of sources dating back to the 70s and beyond. Pursuant to a land acquisition order gazetted on January 28, 1926, several portions of the land in Badia are still under the full control and management of the Federal Government of Nigeria. In October 2015, S4C requested for a copy of the survey plan showing the boundaries of the Nigeria Railway property in Ijora Badia in Lagos State. We also requested to be availed with copies of the survey plans, land demarcation surveys and aerial maps showing the boundaries between the portions of land in Ijora that is still under the control of the Nigerian Railway, and those that are privately owned by the Ojora Chieftaincy. This was necessary for establishing the nature and character of the relationship between the FMLHUD and the evicted residents of Ijora Badia; provide the historical and official reference for delineating land acquisitions, land use and boundaries in Ijora Badia; and to assist in charting the way forward for the exploration of lasting solution to the recurrent land related infractions and forced evictions in Badia, including the compensation of displaced families. The above request was the basis of the January 13, 2016 meeting with the Federal Controller for Land and Housing, Mr. Kenneth Agboa. After a very exhaustive conversation with the federal government officials regarding the contentious land-related issues surrounding the recurrent evictions in Badia, a date was scheduled for the joint tour of the demolished sites, together with S4C legal team and Badia evictees. On Thursday, January 28, 2016, the Federal Ministry of Lands, Housing and Urban Development sent a high-powered delegation to visit the demolished site of Ijora Badia East as part of its responses to Spaces for Change (S4C)-led advocacy on behalf of the evicted community. The delegation pledged their commitment toward the expedient and amicable resolution of issues and interests on the land. The leader of the delegation, Mr. Mr. Agboa, stated that identifying the exact expanse of land in Ijora Badia under Federal Government control was a necessary first step towards the resolution of the conflict. Spaces for Change continues to follow-up and take concrete action to secure the quick resolution of the multifaceted Issues arising from the displacement of the community.